Iron Man 2 slots review. Casino sites with Iron Man 2 slots online. Iron Man 2 slots features and winning symbols. Iron Man 2 slots machine is the release of the popular Marvel comic-based gaming sequel and has quickly become one of the most played slot games online. This fun and rewarding slot game feature double-stacked symbols that not only give the reels a unique and distinctive look but also generate many more coinciding wins than before. Like its predecessor, Iron Man 2 slot is a five reels game with 25 paylines with even more frequent payouts that are guaranteed to satisfy casual players and professional slot players alike. 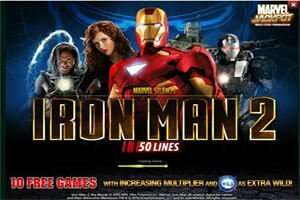 The Iron Man 2 Slot game is also part of the Marvel Jackpot progressive network – a large network of casino and games all adding up to the total Jackpot cash prize. Here’s our list of recommended online casinos and bingo rooms for playing Iron Man slots 2 online. As it happened with Iron Man slots game there is Scatter Pays available in the game which not only pays out handsomely but also triggers the Free Spins Bonus Game with an added bonus: the multipliers. Get three or more Scatters in view and you’re looking at 10 free spins with a multiplier that starts at x2 and increases with each spin. If Iron Man slots provided great winning chances and bonuses, you’d expect the new model to give you even more, right? That’s where the Frozen Extra Wild in Free Games comes into play. You see, when you unlock the free games bonus, Iron Man’s special reactor symbol remains frozen in the middle of the reels during all free game spins, serving as Extra Wild to help you win more. The same goes for the Stacked Wilds also present in both versions. In Iron Man 2 slots machine there’s the Iron Man, War Machine and four War Machine symbols that ar stacked on both reels.